Nate Alcasid is living up to the expectations of having two of the country's finest singers as parents. The kid can sing too! Proud mom and Asia's Songbird Regine Velasquez sang "Pangako" live with 7-year old Nate during the special press previous of their new ad for Jollibee spaghetti. The popular hit is also the background track of yet another heartwarming ad by the country's favorite fast food chain. You can watch the ad below. But first, here's a video of the live performance of the Alcasids. This is not the first time that Regine and Nate worked on an endorsement together, but she believes that this one with Jollibee is the most special. Upon first review of the storyboard, Regine said: "Umiyak talaga ako. I said, "pinag-isipan talaga nila." I've never done anything like this, a commercial that celebrates my being career woman and a mom." 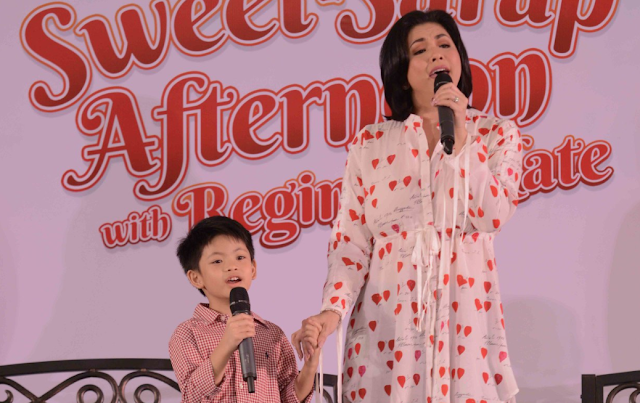 In the commercial, Regine revisits a familiar scene -- a full concert auditorium with thousands of adoring fans -- with a sweet sarap surprise backstage for Nate. The ad goes on to show us special everyday moments between mother and son, with Regine narrating how being a mom has she new light on day-to-day situations. Get ready to go sentimental. Watch the ad below.